8oz Glass Gourmet Chef's Jar with wooden spoon filled with Smoked Cherrywood Sea Salt. Cherrywood Smoked Sea Salt is made with pure Sea Salt that has been slowly smoked above a Maine Cherrywood fire. The result is a smooth, slightly sweet tasting sea salt. Salt grain: Fine Salt color: Natural golden/medium brown coloring from the smoking process. *This salt does not supply iodide, a necessary nutrient. 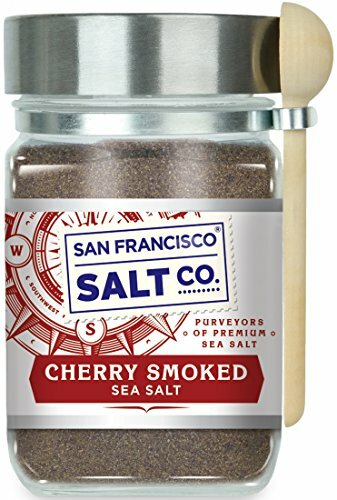 100% NATURAL SMOKED SEA SALT - Our Cherrywood Smoked Sea Salt is Non-GMO, and does not contain any MSG, Soy, Gluten, Dairy, or anti-caking agents. We package in our U.S.A, GMP certified packaging facility that is 3rd party audited, by SCS Global. Crafted in the USA. SMOOTH, SLIGHTLY SWEET FRUITY FLAVOR - Add dramatic flavor to Meat, Salads, Eggs, Caramel Sauces, and more. AVAILABLE IN FINE GRAIN - Fine Grain is ready to sprinkle directly on to food.